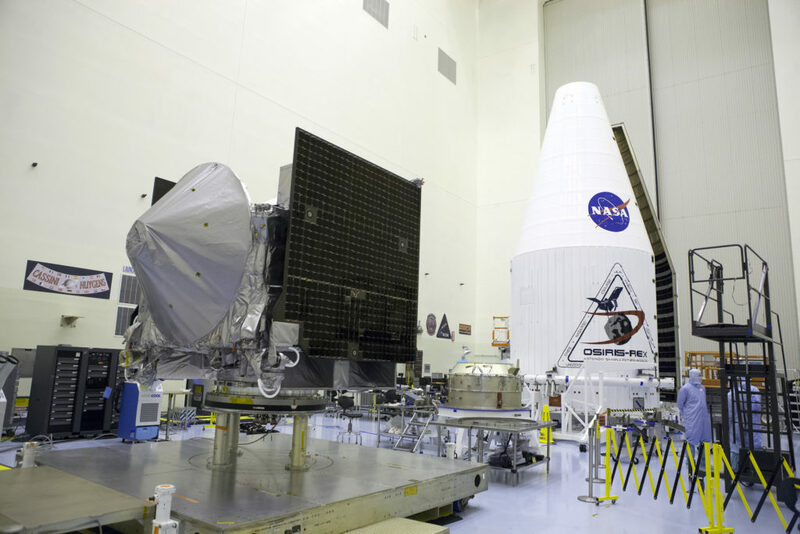 NASA’s OSIRIS-REx spacecraft comes one step closer to launch today as it is sealed inside the two-piece payload fairing that will protect it during the critical early minutes of liftoff. 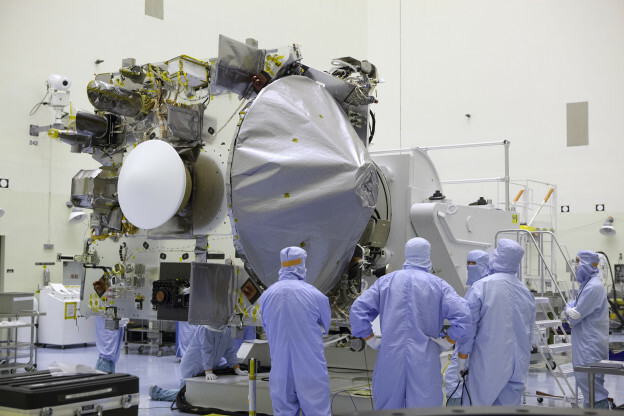 This process, called encapsulation, is taking place inside the Payload Hazardous Servicing Facility (PHSF) at Kennedy Space Center, where OSIRIS-REx has undergone prelaunch processing since its arrival in Florida in May. The United Launch Alliance Atlas V rocket that will boost OSIRIS-REx into space also is progressing toward launch day. The first-stage booster and its Centaur upper stage are in place at Space Launch Complex 41 on Cape Canaveral Air Force Station, where a tanking test is planned for Thursday. 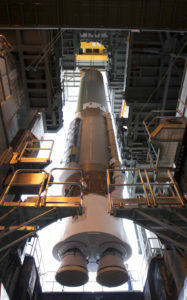 Early Monday morning, the payload fairing containing OSIRIS-REx will roll from the PHSF to the launch pad, where it will be mated to the Atlas V.
NASA’s OSIRIS-REx spacecraft – and the rocket that will carry it into space, the United Launch Alliance Atlas V – are making significant strides toward launch, planned for Sept. 8. 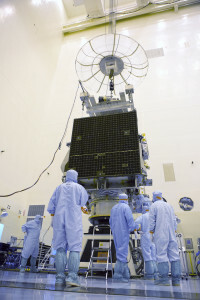 Inside the Payload Hazardous Servicing Facility at the agency’s Kennedy Space Center in Florida, technicians have installed thermal blankets around the spacecraft (pictured above), culminating with a solar array illumination test today. These activities set the stage for spacecraft closeouts, weighing and fueling, planned for next week. 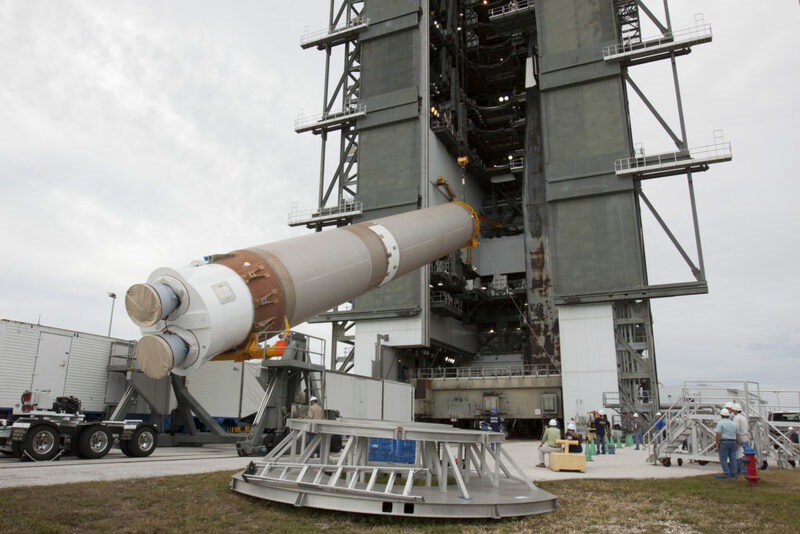 The Atlas V rocket is coming together across the Banana River at Cape Canaveral Air Force Station. 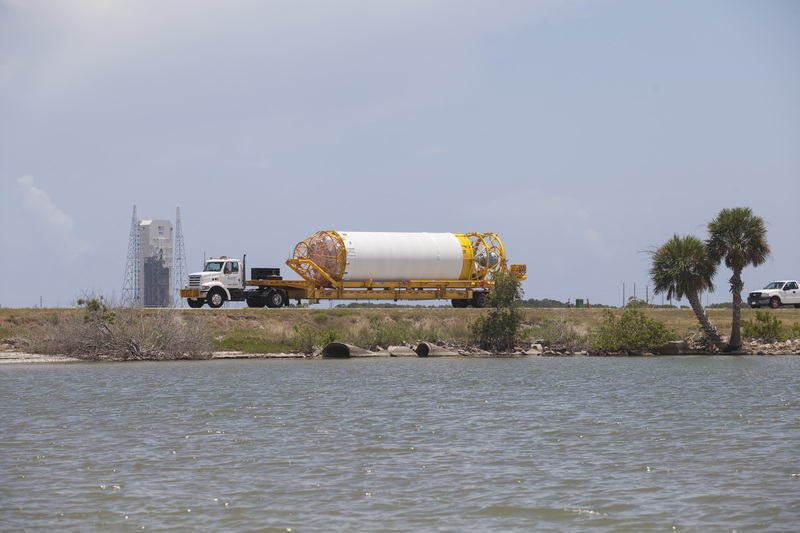 The vehicle’s Centaur upper stage arrived July 21 (center photo), and the first-stage booster followed on July 29. Both elements currently are in the Atlas Spaceflight Operations Center. 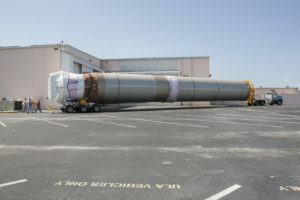 The rocket’s booster, solid rocket motor and Centaur upper stage are slated to be assembled Aug. 8 through 10 in the Vertical Integration Facility at Space Launch Complex 41. 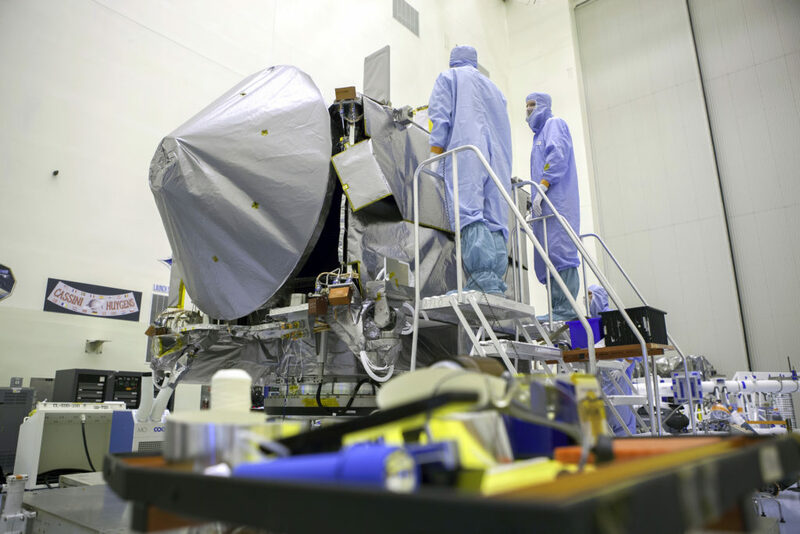 OSIRIS-REx will be the first U.S. mission to sample an asteroid, retrieve at least two ounces of surface material and return it to Earth for study. Analysis of the sample will reveal the history of the asteroid, called Bennu, over the past 4.5 billion years. At NASA’s Kennedy Space Center in Florida, preparations are underway to launch a mission to an asteroid that may hold clues to the origin of the solar system and the source of water and organic molecules found on Earth. The Origins, Spectral Interpretation, Resource Identification, Security–Regolith Explorer, or OSIRIS-REx, spacecraft arrived at the spaceport from Buckley Air Force Base near Denver aboard an Air Force C-17, touching down on May 20 at the Shuttle Landing Facility. Since that time, the spacecraft was moved to the Payload Hazardous Servicing Facility where technicians and engineers removed it from its shipping container the next day and connected it to a rotation fixture for spin balance testing. 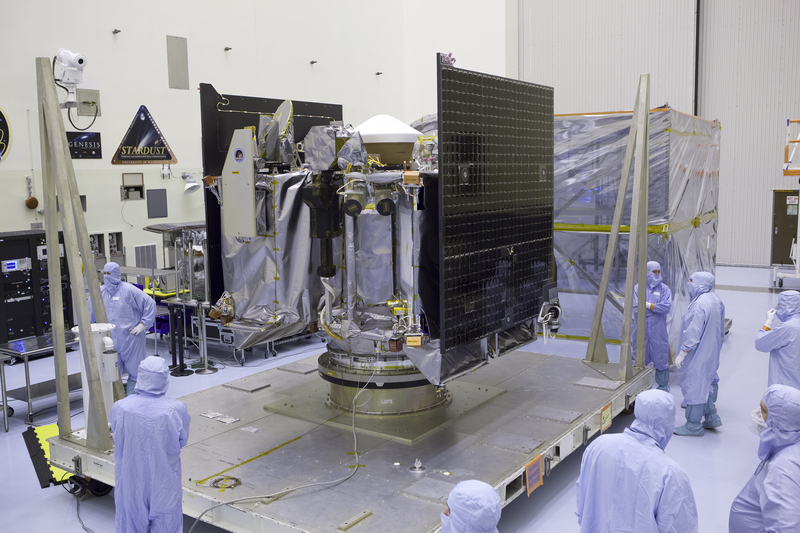 A test of the OSIRIS-REx solar array deployment mechanism recently was conducted along with inspection, cleaning and functional testing of the arrays. An interface test with the Deep Space Network currently is underway. Targeted for liftoff at 7:05 p.m. EDT, Sept. 8, 2016, aboard a United Launch Alliance Atlas V rocket, OSIRIS-REx will be the first U.S. mission to sample an asteroid, retrieve surface material and return it to Earth for study. 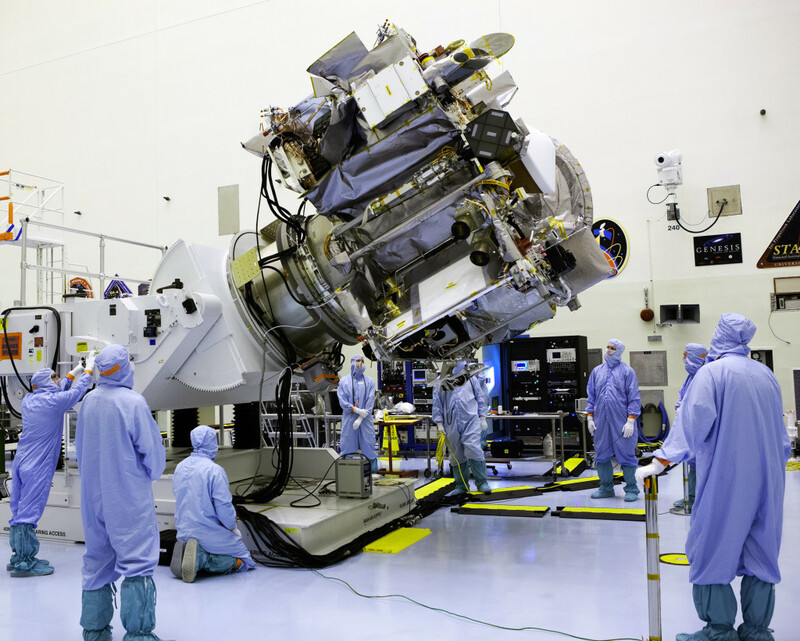 After OSIRIS-REx arrives within three miles of the asteroid, Bennu, the spacecraft will begin six months of comprehensive study and mapping of the surface. The science team then will select a location where the spacecraft’s arm will take a sample. The spacecraft gradually will move closer to the site, and the arm will extend to collect at least a 2.1-ounce sample for return to Earth in 2023. 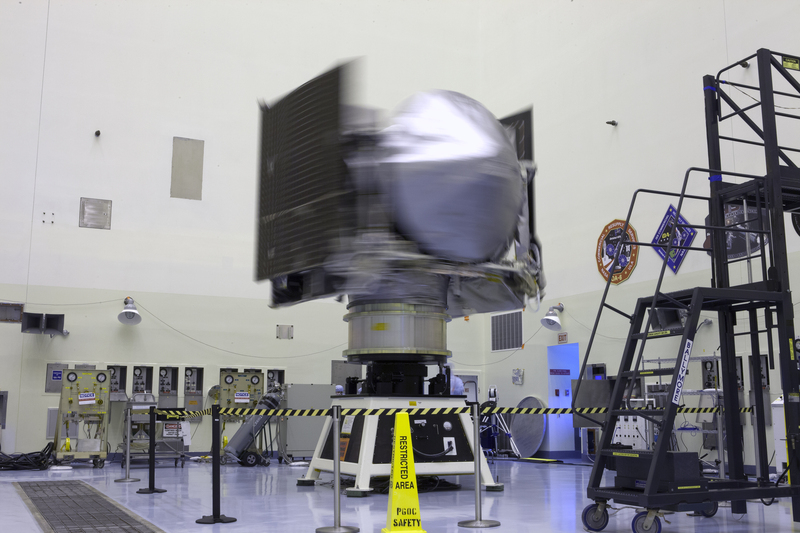 In the image above, NASA’s OSIRIS-REx spacecraft rotates on a spin table during a weight and center of gravity test May 24 inside the Payload Hazardous Servicing Facility at Kennedy Space Center in Florida. An overhead crane carefully returned the spacecraft to its work stand May 26 (right) to continue prelaunch processing. OSIRIS-REx, stands for Origins, Spectral Interpretation, Resource Identification, Security – Regolith Explorer. 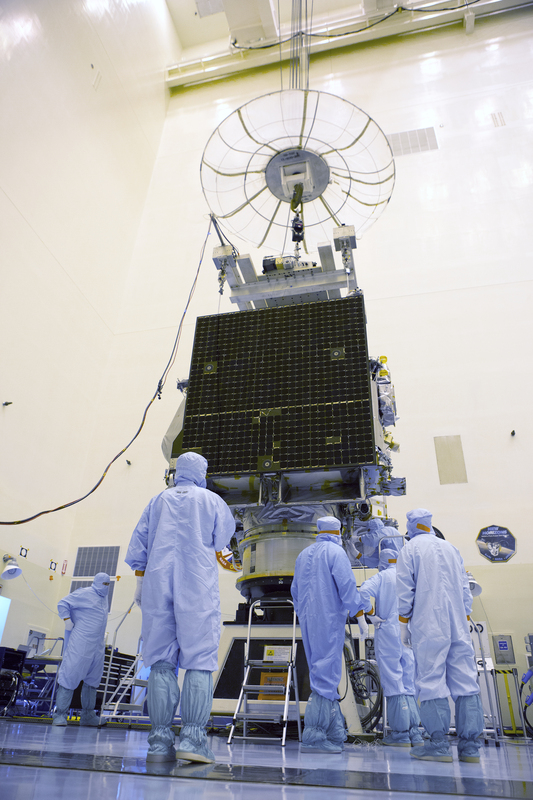 The spacecraft will travel to an asteroid, Bennu, retrieve a sample and return it to Earth. Liftoff is targeted for Sept. 8 aboard a United Launch Alliance Atlas V rocket. 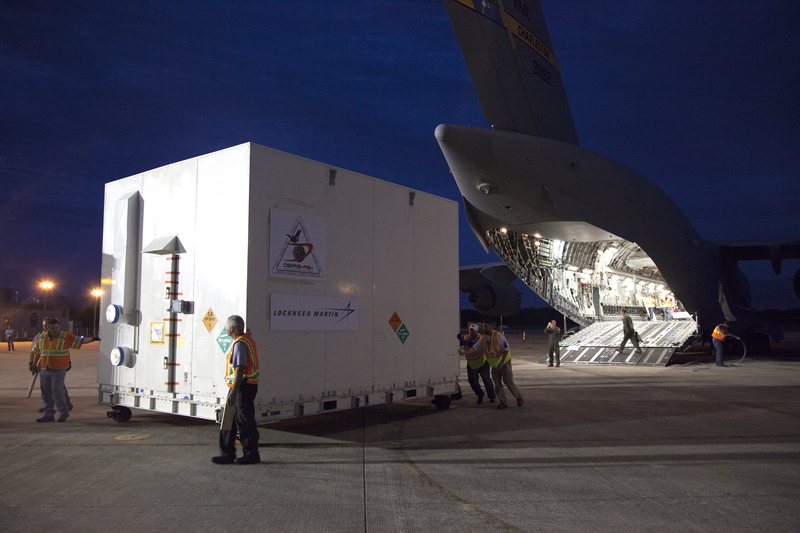 NASA’s OSIRIS-REx spacecraft arrived at Kennedy Space Center in Florida on Friday evening aboard an Air Force C-17 cargo aircraft. OSIRIS-REx stands for Origins, Spectral Interpretation, Resource Identification, Security – Regolith Explorer. This will be the first U.S. mission to sample an asteroid, retrieve at least two ounces of surface material and return it to Earth for study. The asteroid, Bennu, may hold clues to the origin of the solar system and the source of water and organic molecules found on Earth. 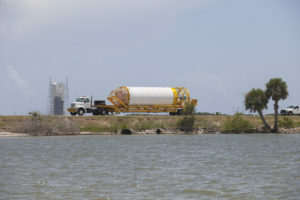 Tucked inside a shipping container, the spacecraft traveled from Lockheed Martin’s facility near Denver, Colorado to Kennedy’s Shuttle Landing Facility. It was carefully offloaded from the aircraft and transported to the spaceport’s Payload Hazardous Servicing Facility to begin processing for its upcoming launch, targeted for Sept. 8 aboard a United Launch Alliance Atlas V rocket.